Premier Mark McGowan and Health Minister Roger Cook at RPH. Stock photo. WESTERN Australia’s oldest public hospital is set for a $22.7m upgrade to its intensive care unit. 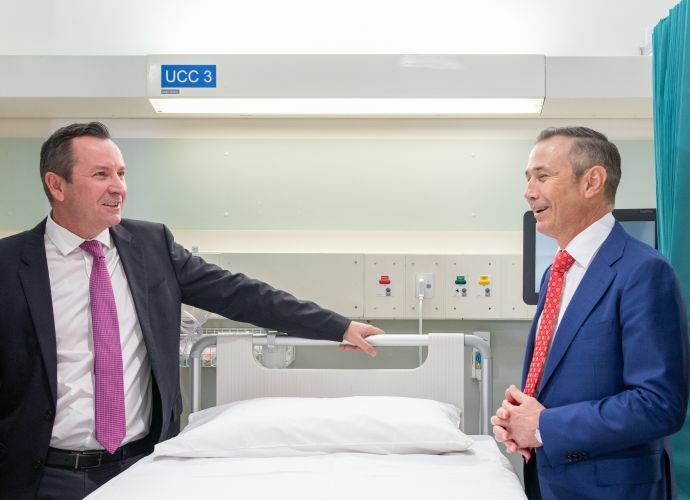 Premier Mark McGowan and Health Minister Roger Cook made the announcement on Monday morning at Royal Perth Hospital (RPH) as part of the 2019-20 State Budget. The 24 bed RPH ICU has not been refurbished since it was built in 1988, apart from the addition of four isolation rooms, and has the largest trauma workload in the state. The Premier said the upgrade was long overdue. “I’m pleased this funding injection is going towards significant infrastructure improvements to help make the patient and their family’s experience better,” he said. Mr Cook said the upgrades would enable the ICU to introduce new technology to continue to provide the best possible care to those who need it most. “With the ICU, we are talking about patients who are critically ill – we owe it to them, their families and friends, and the staff within RPH, to give them the best possible chance of getting better, something this funding achieves,” he said. The ICU refurbishment will include bigger patient areas with windows in each, more single-patient rooms, a dedicated area for distressed relatives, more storage and drug preparation areas, a modern ICT system and a simulation room to improve staff training.